All work is carried out by a qualified engineer with over 9 years experience at providing support to home and business users. 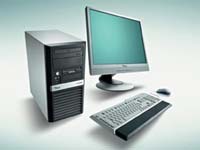 We have a wide range of services available to cover every computer and network eventuality. Now including broadband issues. We are based in Perth , and cover towns in Perthshire and surrounding areas. + Alot More Just ask !! For computer repairs & maintenance in Perth , Fair City I.T. Solutions is your solution, we aim to provide 110% Satisfaction.